"This zesty meatball recipe is always a hit with any crowd. The basic, two-ingredient sauce can be switched up by simply combining Heinz Chili Sauce with any sweet spread such as peach jam, grape jelly or mango chutney. And, for the ultimate shortcut, you can use prepared meatballs." Preheat oven to 350 degrees F (180 degrees C). Gently blend beef, breadcrumbs, egg, milk, onion, garlic, salt and pepper until evenly combined. Form into about 40 bite-sized meatballs. 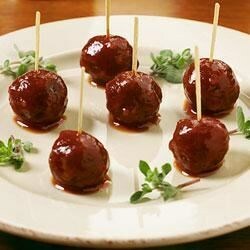 Place meatballs on a foil-lined, rimmed baking sheet; bake for 20 minutes or until cooked all the way through. Combine chili sauce and jelly in a saucepan set over medium heat. Cook, stirring, until jelly dissolves, about 5 minutes. Add cooked meatballs to the sauce; reduce heat to medium-low and simmer for 10 minutes. Makes 8 servings. These 5-star cocktail meatballs are simmered in a simple sweet and sour sauce. Twist 1: For a meat variation, use ground turkey or pork for the ground beef. Twist 2: For a vegetarian option, purchase ready made veggie “meatballs” and heat in the sauce for 10 to 15 minutes. Twist 3: For a peachy version, substitute peach jam for the red currant jelly. Twist 4: For a tangy citrus version, substitute citrus marmalade for the red currant jelly. Twist 5: For a sweet and spicy version, substitute hot pepper jelly for the red currant jelly. Twist 6: For a grape-licious version, substitute grape jelly for the red currant jelly. Twist 7: For an Indian-influenced version, substitute mango chutney for the red currant jelly. I use the currant jelly/chili sauce combo for my Sweet n Sour kielbasa (recipe on this site) I've been making it for YEARS and it's so simple! Can go right in the Crockpot...I love this sauce! I've been making this receipe since 1977, it is easy and a crowd pleaser everytime. You can't go wrong with this meatballs and Heinz Chili Sauce. yum! just what I was looking for!